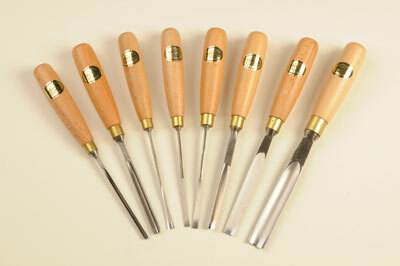 Many people are surprised to hear chisels described as precision instruments, but they can be if prepared and used well. Let's take a vertical paring task. Or, rather, lets not. My preference in vertical cutting is to chop, using a mallet with restrained taps to persuade the chisel through the timber. 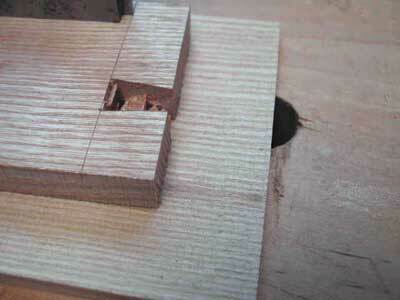 Keeping the cut square is the vital factor, and here you'll find a wealth of different ideas out there. Rob Cosman seems to be able just to do it with uncanny accuracy; some craftspeople clamp a guide block against the line. 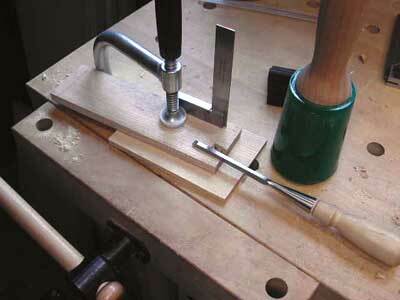 My preferred method - a la Charlesworth - is to sit down on a stool, sighting through to a square behind the chisel. It's easy, reliable and takes virtually no practice to get it right every time - and it's restful for the feet. It's the old mantra - take time, take care. 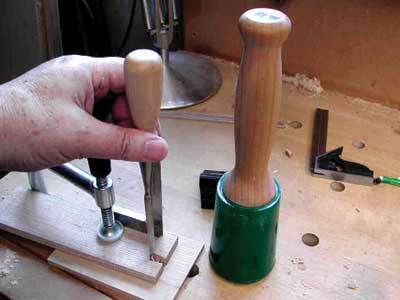 With the work secured to the bench using a clamp or holdfast, put the mallet down where you can see it out of the corner of your eye and use two hands to position the chisel. The holding hand should be steadied - I rest my wrist or heel of the hand on the top of the holdfast - while you pick up the mallet and lightly make that first, definitive tap. 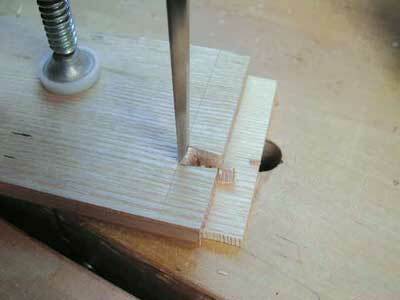 That should secure the chisel in the timber and you can begin to tap toward the half-way point. After a number of light cuts, release the clamp, turn the timber over (brushing away any debris that might dent the timber) and repeat from the other side. 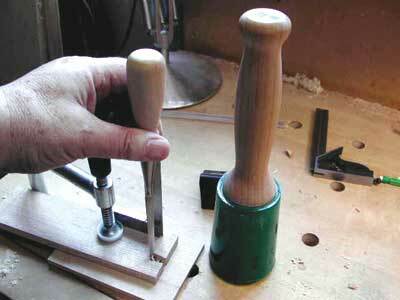 Light cuts are the order of the day: a sharp chisel should take fine, continuous end-grain shavings. Beware the wedge effect - especially near the line. 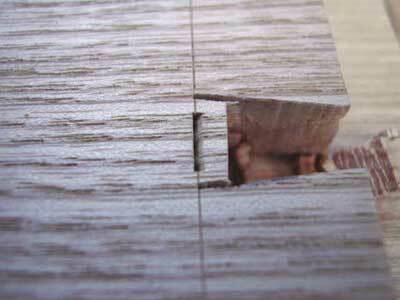 The bevel will want to push the chisel back as it enters the timber, making the cut heavier and less precise than intended. The answers to this are a razor edge and very light cuts. The final cut should only be made when there's just a fraction of a millimetre of waste remaining. Then, feel the edge seat in the cut line, sight to the square, lightly tap the chisel to secure it and then tap it through to the half-way point before again reversing the timber and repeating. Really, this article - indeed, the whole series - has all been about care and attention: take time to prepare the tools, handle them with love and respect, and set up each individual cut meticulously. 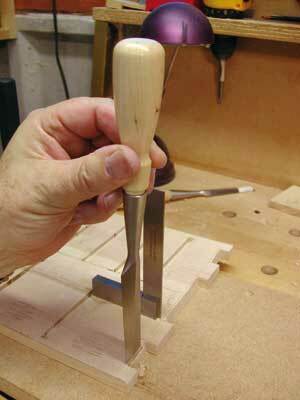 Then let the tool do the work - you just take the glory. 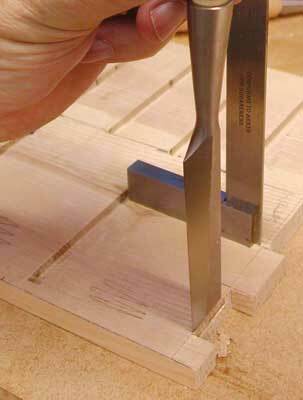 As always, I heartily recommend David Charlesworth's DVDs, and in this case there are two: Precision Preparation of Chisels for Accurate Joinery covers the essential choice and preparation, and Chisel Techniques for Precision Joinery David uses a single-lap dovetail joint to demonstrate chopping and paring techniques. Both these DVDs are invaluable to anyone wanting to improve their woodworking; I've given you a flavour of them, but why not watch the master at work? "Set up each individual cut meticulously"